Who Do You Trust When You Are Buying A Collector Car? You are here: Home / Classic Cars / Who Do You Trust When You Are Buying A Collector Car? When buying a collector car who do you trust? Do you trust the auction company? – many of which are on television providing lucrative entertainment while they make a lot of money selling cars. Do you trust the collector car dealer who may also get air time occasionally? Do you trust the seller? When you buy through an auction company or a dealer you likely will not meet the seller or even know the identity of the seller. If you buy directly from the seller at least you have an opportunity to ask questions from someone who has owned the car and driven it and lived with it for a while. You also get a chance to inspect the car and take it for a test drive or have an inspector you hire do so on your behalf. You may not be able to do this if the car is at an auction but you can do a full inspection if the car is with a dealer or if you buy directly from the owner. As we head into the Monterey Car Week auctions – where the most important collector car auctions of the year will be held that set the trends for the next year – these are questions that I think about. If any of you are looking to buy a collector car anytime soon I am sure you think about this as well. I read many of the auction companies car descriptions and look at the photos. I also read many collector car dealer web sites where I find interesting cars and interesting descriptions sometimes. I always find a car or two that I would love to own. Here are two that I find interesting. They did not describe the ownership history since the 1980s. Wouldn’t a potential buyer want to know that history? I am not aware of any organization or person who has the authority to provide a “certificate of conformity” for an Iso, except Piero Rivolta who owns the Iso brand and I do not think he has seen this car. 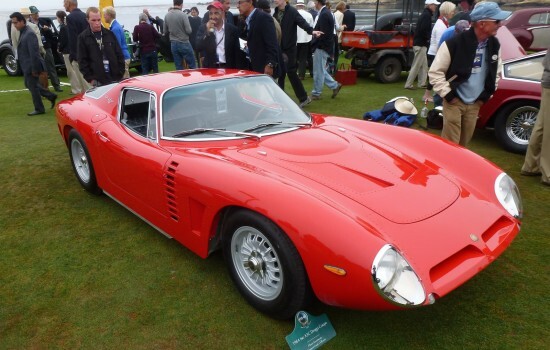 This car is an Iso not a Bizzarrini brand even though Giotto Bizzarrini used a badge that incorporates both the Iso name and his own name – this car is an Iso. I sent an email to Mecum asking these questions and have not had a reply yet. The price is $59,900 which seems quite high for an Iso Rivolta with so many needs. In the photo above you can see the nose badge and the horseshoe, that should be on the grille, are both missing. The location for the nose badge does not have the holes for the badge which always raises a question about front end body work. This 1965 Iso Rivolta is a straight, honest and largely original example that would be an ideal candidate for a straightforward restoration that can also be enjoyed during the process. It is currently finished in black primer and has a vinyl roof and a dark red button-tufted leather interior piped in white that was redone some years ago. Anyone familiar with an original Iso Rivolta GT can tell from these photos that this example is far from original and certainly not “largely original”. The vinyl roof is an obvious non-original feature and the interior that was “redone some years ago” was actually created some years ago by someone and bears little similarity to an authentic Iso Rivolta GT. There are also many parts missing that can be difficult to source. How can this Iso Rivolta “be enjoyed during the process” when it is going to be in pieces for a long time? I don’t even know what they mean by “enjoyed during the process”. Good luck to you all with your collector car search – be careful out there. Can you trust the descriptions of collector cars by auction companies or collector car dealers? Mike, you are touching upon a very good point. I always stress that a proper PPI by an EXPERT more than pays for itself especially on high end cars. I am always surprised when some car collectors decide to forego the process. I know of one particular case where a known local collector sent his friend to look at the car who failed to spot significant prior damage. As the result, the car was acquired for a lot more than its actual worth. When a property is bought, it goes through the escrow to mainly protect the buyer. A sort of an escrow company for classic cars should be established to protect classic car buyers (and sellers) that would handle due diligence on the vehicles. Can’t say that I trust most auction houses completely. Though I do believe most try to uphold some high standards others fall victim to closing their eyes to questionable details. That is why I believe when buying a collector car it is always worth employing an expert to evaluate the car being considered. In the Corvette world there are a few reputable well known experts that are honest and trustworthy in their appraisals. Some of these experts actually work for the auction houses and have been known to turn consignments away because the seller description of the cars is not accurate. One of those experts is the former chief judge of the NCRS, Roy Sinor. He will evaluate a Corvette honestly and has been employed by Barrett-Jackson. That may be one reason Barrett-Jackson gets absolutely top dollar for their Corvettes. ($3.8M for a 67 L88 and $88K for a C3 L88 survivor Keith Martin referred to that price as a “gamechanger” for C3 Corvettes. So on the whole I would be very selective about where I purchase a car (Did you hear about the auction that sold a 1967 Black 427 Corvette from a famous collection that turned out to be a reworked 64?) .I would always pay to have the car validated by an expert.